Incorporated in 1880, Crested Butte quickly became a bustling coal-mining town. One year later, the railroad arrived in Crested Butte, bringing an economic and population boom with it. Eventually, gasoline and electricity began to replace coal, resulting in the decline of the mining industry in Crested Butte. The Denver and Rio Grande Railroad removed its tracks in 1955, effectively ending an era. However, in 1960, a new Gunnison County adventure began. Two men from Kansas purchased a ranch northeast of Crested Butte, building a ski area atop Crested Butte Mountain. This area would grow into what is now known as Crested Butte Mountain Resort. Crested Butte enjoys close to 350 days of sunshine each year. The average high temperature in July is 76 degrees, with January lows plummeting to around 0 but averaging around 20F. Annual rainfall is roughly 23 inches, and yearly snowfall is about 200 inches. Gunnison Watershed School District serves the educational needs of students in the Crested Butte and Gunnison communities. Students can continue their education at Western State Colorado University, a four-year, accredited state college. Gunnison Valley Hospital houses the Gunnison Valley Health Program, a fully integrated health system providing comprehensive care to our citizens and part-time visitors. Air travel is provided by Gunnison-Crested Butte Regional Airport. With a variety of runs suited for beginners and experts alike, Crested Butte Mountain Resort is the obvious choice for skiing and snowboarding enthusiasts. If snowshoeing, cross-country skiing or snowmobiling is your preference, the town of Crested Butte maintains a number of groomed trails. Additionally, the surrounding mountains offer some of the best back country skiing in all of Colorado. The area is also home to an abundance of challenging and scenic mountain biking trails. Alpine forests and dramatic vistas create a breathtaking backdrop for your two-wheeled adventure. 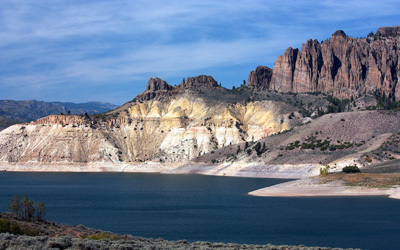 Boasting 96 miles of shoreline, Blue Mesa Reservoir located just 10 miles west of downtown Gunnison is Colorado’s largest body of water. It’s a feature destination for lake trout, Rainbow Trout, German Brown Trout and Kokanee salmon fishing. Sailing, rafting and windsurfing enthusiasts also visit the reservoir in droves and ice fishing is most popular in the winter months. 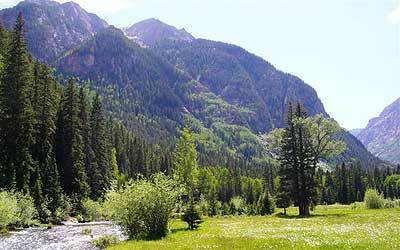 The adjoining Gunnison National Forest offers endless hunting and hiking. Blue Mesa Reservoir lies near the edge of Black Canyon of the Gunnison National Park, one of Colorado’s most remarkable attractions. Sculpted over two million years by the raging waters of the Gunnison River, this park is characterized by ancient rock, jagged spires and steep cliffs. Arts and culture are alive and well in Crested Butte and the Gunnison Valley. The Crested Butte Mountain Theatre is the longest continuously operating community theatre in Colorado. The Gunnison Arts Center offers a hands-on, artistic experience through an assortment of programs in the visual, literary and performing arts. Our town’s history is meticulously chronicled at the Crested Butte Mountain Heritage Museum. We enjoy several celebrations throughout the year. A few of the most anticipated events are the Crested Butte Film Festival, Crested Butte Music Festival and the Crested Butte Wildflower Festival.